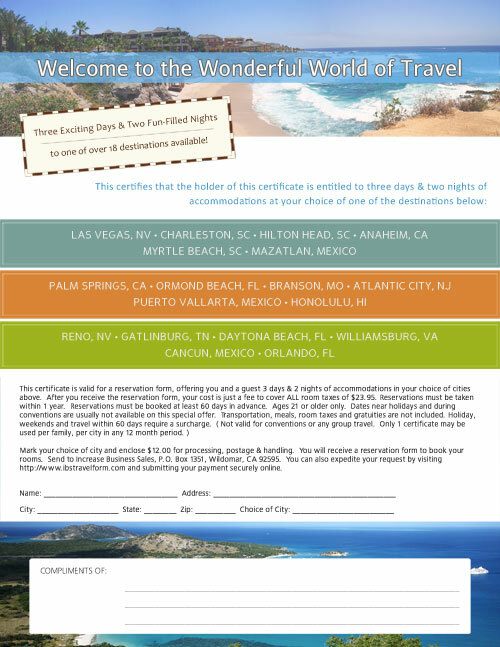 Each vacation certificate guarantees you and your customer 3 days and 2 nights in deluxe hotel accommodations in a choice of 18 cities. 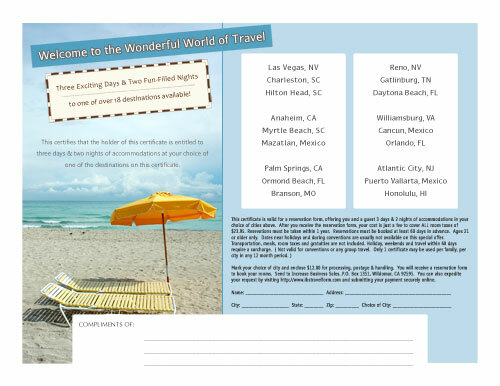 You simply mail in the vacation certificate or register it online with your choice of one of the cities and a $12.00 processing and handling fee. These room nights are worth up to $400.00 for the two nights. 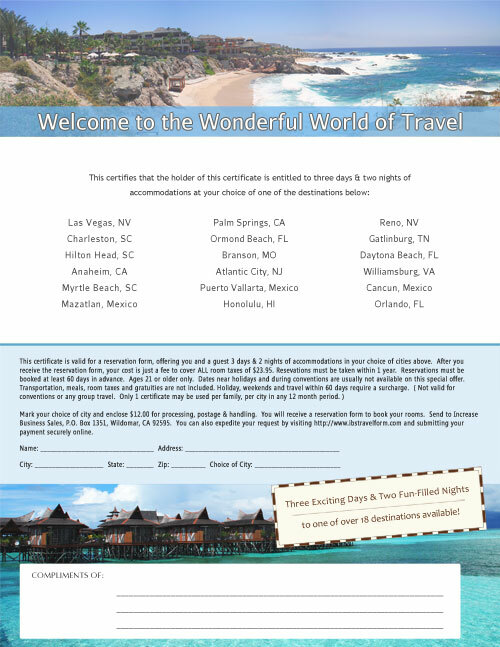 We made it extremely easy and affordable for any business to utilize our travel certificate. Instead of having to purchase certificates individually, we have provided for a small fee, allowing you to print an unlimited number of certificates anytime you want 365 days a year. Whether you need 100 or 100,000 you will quickly come to see that it’s considerably less than paying for each one individually. Why we are different than other companies. We only charge your customers a processing fee of $12.00, not the $15.00 and higher all other companies charge for a processing fee. Your unlimited printing does not run out after a year either. Printing of the Certificate: You will receive an online account where you will login at to print an unlimited number of certificates to hand to your customers. There is no limit on how many certificates you print. Personalization: You can personalize the certificate to include your business name and/or website address in the "Compliments of" area. Your information will show on both the printed certificates. You can change this information as many times as you want, so if you have more than one company, you can print separate certificates with each business name on them. Personalization: You can personalize the certificate to include your business name and/or website address in the "Compliments of" area. Your information will show on both the printed certificates. You can change this information as many times as you want, so if you have more than one company, you can print separate certificates with each business name on them. Personal Administration Area: You will receive access to your own administration area on our website. You will then be able to log in and customize your cerificate with your own business name, or with whatever you would like.